relative pitch, pitch distance, precision hearing, pitch distance accuracytch sense. PitchBlitz focuses on speed and pitch-distance recognition with precision. Exercises help you to improve your relative pitch hearing abilities. PitchBlitz prepares you for the Pitch Grid Test. The Pitch Grid Test is a relative pitch test that evaluates your ability to discriminate pitch-distances. 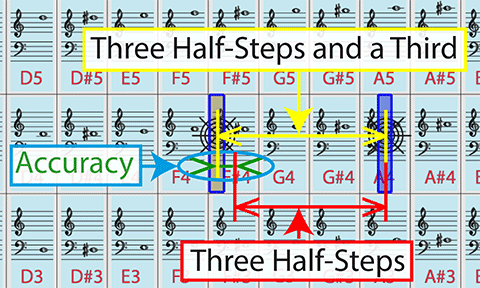 For the test, the notes are laid out in form of a grid: There are 4 rows of octaves starting from C2 to C5. The number of columns depends on the selected the grid sensitivity. E.g. 100 cents correspond to 12 columns (chromatic scale); 33 cents correspond to 36 columns. In this way pitch-distances beyond half-step precision can be trained. The program PitchBlitz has a number of options that facilitate the learning process. The most important is that you can select an option that forces you to answer pitch questions in pitch distances.